Ready to sing your heart out? Whether you’re a “Rock Band” aficionado, moonlight at the cabaret, or just want to blow off a little steam, get ready to step up to the mic! 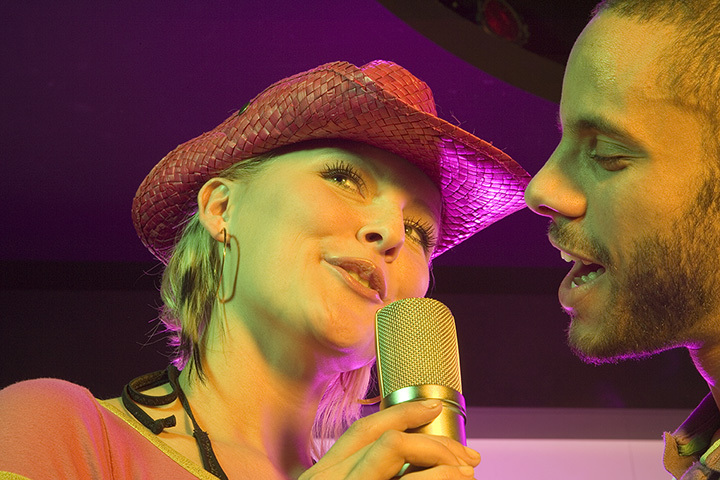 Check out our 10 favorite karaoke bars in Virginia. Brass Bell Steakhouse and Bar is one of the local go-to hangout spots in Virginia Beach. The steak is good and inexpensive. The Virginian Pilot awarded Brass Bell the Gold Award for Best of Virginia Beach, as voted on by readers. Every Friday and Saturday are karaoke nights. With 20,000 songs in their library, you’re sure to know a tune or two. Lulu Café isn’t just one of the best Korean restaurants in the Centreville area, but their authentic karaoke rooms, known as “noraebangs” in Korea, offer an experience you shouldn’t miss. Enjoy an authentic Korean barbecue meal before hitting one of the backrooms where you’ll find private space for your party to get your Mariah Carrey on. The videos come straight from Korea, so you can expect a certain Asian flair. Book your room ahead of time and have your food delivered to you mid-song. Rock It Grill is a casual bar and grill with a diverse menu, serving hamburgers, tacos, and seafood, and more. But the real attraction for karaoke lovers is the nightly singing: that’s right, Rock It Grill offers karaoke every night of the week. As the name implies, most of the songs are rock oriented, but that doesn’t mean you won’t find a few other tunes in the catalogue. Patriot’s Pub and Grill in Fairfax, Virginia, is a good, old-fashioned, American pub. The atmosphere is homey and warm, and their doors are open every day. Stop by for trivia on Wednesdays, live music on Thursdays, and karaoke on Fridays and Saturdays from 9:30 p.m.- 1:30 a.m. You’ll find yourself wanting to come back soon. Richmond, Virginia, is known as one of the creative hubs in the Commonwealth, and one of the most accepting. Therefore, it’s no surprise that Babe’s of Carytown, a lesbian and gay bar, is one of the best karaoke spots in town. Stop by for Southern pub fare, drag shows, and, yes, karaoke. Sing your heart out with pride. The Belmont House of Smoke in Norfolk, Virginia, is one of the funkier, hipper places on this list. The menu is barbecue-centric, with ribs, sandwiches, samplers, wings, and more available, along with an extensive beer list. Join the Belmont crew on Thursday evenings for $2 Coronitas and karaoke starting at 9 p.m.
Brickhouse Tavern, near Christopher Newport University in Newport News and the College of William and Mary in Williamsburg, is a New York-style casual Italian eatery serving up pizza, sandwiches, pasta, and salad. Stop by for private parties, nightly food specials, and, of course, the regularly scheduled karaoke. Check in before coming for karaoke to make sure it is on the schedule that night, as the days are subject to change. Café Muse offers private karaoke singing rooms with over 60,000 songs in their database. Choose from English, Japanese, Chinese, Korean, Vietnamese, Philippine, Thai, and Spanish language songs while enjoying Asian-inspired dishes. You can book a small, medium, or large room by the hour, with rates changing based on time of day and day of the week. The folks at Dogfish Head Alehouse describes themselves as “off-centered food and drink for off-centered people.” The menu includes wood-fired burgers, seafood, and pizza, whereas the beer menu changes every day. Much of the craft beer comes from the Dogfish Head Brewery. Besides the delicious food and beer, Dogfish hosts regular karaoke jam events, pitting different genres against each other for prices. Breakers Sky Lounge in Herndon, Virginia, is much more than another karaoke bar: it is a nightlife experience. Stop by the restaurant for a full-service menu. Swing by the bar for custom cocktails and fan favorites. Play billiards, listen to the top DJs and live bands in the area, and watch whatever’s on the six projectors and 18 LED TVs. The Lounge is two levels and over 12,000 square-feet. Oh, and karaoke nights are three days a week on Wednesday, Thursday, and Friday.